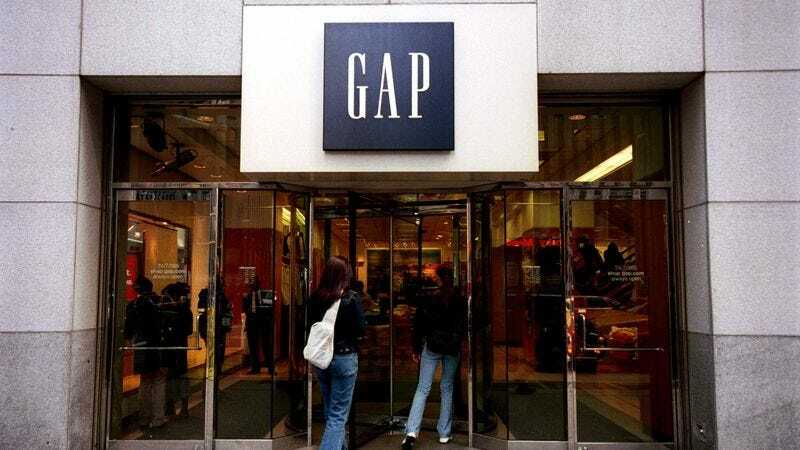 SAN FRANCISCO—Expressing regret for any inconvenience the move caused, clothing retailer Gap Inc. said Tuesday that its plan to close 175 locations nationwide would leave Americans with fewer options for buying a pair of pants for a friend’s wedding at the last second. “The Gap has always provided a convenient place for people attending an out-of-town wedding to hastily buy a new pair of khakis after accidentally spilling coffee on the pants they were wearing, and we’re aware of the difficulty eliminating the stores will have on these individuals,” said Gap spokesman Nathan Levine, adding that the company would be shuttering roughly one quarter of its U.S. locations, places where, previously, people who suddenly discovered their dress shirt had a hole in it only minutes before a job interview could buy an affordable replacement. “Whether you just noticed sweat stains on your favorite polo on the way to a barbecue or you need a pair of decent slacks because you suddenly realized a restaurant you’re attending a party at has a stricter dress code than you thought, we appreciate you making the Gap your destination all these years.” Levine went on to say that people who forgot a bathing suit and needed an $8 pair of shorts they could wear into a pool still had plenty of options, however, as the downsizing would not affect any stores belonging to Gap’s Old Navy brand.